I will begin by defining the most basic elements of a map as the Space, the Walkway, and the Path. The Space is best thought of as a room or open area that has several ways leading into and out of it. A Walkway is well understood as the portion of a map that a player will traverse to move from one Space to another, is generally of singular width and height and has only two openings at either end, though a third or even fourth opening along the Walkway is possible. A Space can be a team’s base, a room, a court yard, a hill top, a balcony ledge, etc.. For our purposes a Walkway can be a tunnel, a bridge, a corridor, a simple doorway, or even a man cannon or teleport. On the other hand, a Path is not a tangible construct of the Geometry, but rather the actual line or area of movement within a Space or a Walkway, and is defined or dictated by the Geometry. Spaces should have three or four ways in so that a team can push from multiple directions to surprise and flank camping defenders. If there are only two ways into a Space, then the offensive push becomes far too predictable – and typically boring. On the other hand, if you provide too many ways into a Space, the Space begins to feel indefensible which leads to deprived game play. 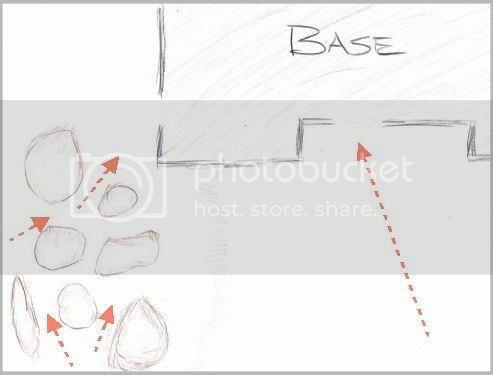 When I say that a base should have several ways in so that an offensive push can surprise and flank defenders, then you need to understand that I mean the ingress Paths to the base must not all lead to one side of the interior of the Space, lest there is no flanking possible. Instead a base becomes interesting if there are ingress Paths from opposing directions so that given adequate team work a push can come from both ends simultaneously. And a vertical drop down (for example) into a base also serves as an opportunity to flank as it allows entry into the base from an opposing end relative to other ingress Routes. A central entrance into the base tends to represent the unique means to reach the center of the Space more quickly and with less opposition, increasing the element of surprise. Spaces should have three or four ways out so that a player can move safely about the Space knowing that if they have to retreat in a hurry, their retreat is not dictated solely by which entrance the enemy may choose to use. This point is particularly important if the Space is large enough that once a player has moved to the center of the Space they don’t feel that their only choice is to move back the entire way they came in just to find cover. An ingress Path into a Space may be one way – for example, dropping down through a ceiling, exiting a one way teleport, or flying in on a man cannon from another Space. Similarly, an egress Path from a Space may be one way – for example, jumping off a balcony, entering a one way teleport, or jumping onto a man cannon for a quick escape. The number of ingress Paths and the number of egress Paths do not have to be the same, but they should both be roughly three or four each in most cases. A Space with only one way in is a unique situation that has very limited purposes – typically for a holdup position where the defenders have an advantage of shooting anyone coming in the door with a single shot (e.g., shotgun, sword), but are at the disadvantage that they must never miss and they may find themselves against numerous enemies in one coordinated rush. This type of Space is frowned upon in general due entirely by its promotion of camping, but it has a significant following most notably in the Infection style playlists. Keep this in mind whenever you forge your map – that you do so for a specific segment of the population and you want it to play in a way that they enjoy playing the game. A Holdup position could be a Dead End or it could have an additional egress Path leading out. Dead Ends are the types of Spaces (and Walkways) you will want to avoid unless you intend to create a trap. But even if it is intentional, you want to make it obvious to players before they turn into the Dead End. No one wants to run down a tunnel with a turn at the end only to find they were in a Dead End all along. Paths, whether through Spaces or across Walkways, that converge into a single Space should provide variation of approach styles to make the map more interesting for a wide range of players. Some players may enjoy Paths that have lots of LOS blockers and sharp corners and tend to promote CQC style game play. Others may enjoy taking the risky Path that requires a rush across a generally open area to surprise the defender camping in the Space. The various Paths should promote various styles of play. At the same time, each style of play that is promoted should not be implemented at the expense of others along any one Path; otherwise the most favorable Path would be overly used, unpredictability would be lost, and the Game Play becomes stale and boring. For example, if a Path favors CQC but cannot really provide any other style of play, then some teams may avoid it entirely, which means their strategy becomes more predictable as they have less Paths to choose from, and defending a base becomes less challenging, stale, and boring after a while. If a base has an objective in it (e.g., a team flag), then there are generally two scenarios that you will need to account for. Firstly, there exists a sizable segment of the population that simply enjoy camping the base as the defense squad of their team. They enjoy being the player that saves their team’s honor and being a savvy defender that demonstrates unique problems for the flag thief to overcome. This in turn makes the game play very interesting for the flag thief who needs to figure a way to overcome a defender whose strategy, talents, or use of weapons and abilities are somewhat novel. But it is the second scenario that I want to focus on more – the players who are never happy with camping and want to push their defense line out from their base, engage the enemy sooner and more frequently, and score more kills through out the game. It is these players that you need to focus on more, because having too many Paths into their base can retard their movement out of their base. It has been demonstrated that a very unintuitive behavior is adopted by players who want to push their defense line out of their base toward the middle of the map – that if their base is riddled with ingress Paths, that they tend to stay back to defend the objective out of fear that their base itself is indefensible. In other words, too many Paths into a base give the team a feeling that the base cannot be defended if they leave it. This can be an imaginary fear, but it can result in a real retarding of their movement, and that will lead to a feeling of boring game play for these types of players. Your map would in effect deprive them of the fun of pushing out from their base. So you need to limit the ingress Paths into a team’s base or any critical Space that a team would prefer to control or defend to a healthy and balanced number. A map requires several Paths from one end to another, and like before should promote varying approach styles to make the map interesting to a wide range of players. This is especially true when you have two team bases that you need to promote movement between. While the Paths may travel through several Spaces along the way, the idea here is that Pathing across a map should provide the same Game Elements of variation of approach to increase the map’s overall fun factor, and be three or four unique Paths to eliminate predictability and depredation of game play. When a map is designed for large parties and vehicular movement, then the Paths themselves are defined more by the vehicles than anything else. How you structure the edges of Walkways or Spaces that the Paths cross through for foot movement will determine what kinds of play styles players can engage in as they travel those Paths. Likewise cross map Paths must not be too numerous, or a defending team will have trouble pushing out, not knowing which highway they need to have a guard posted at. This is the same situation as with a base, but widened across one half of the map. Each Space should have three or four ingress Paths into it and three or four egress Paths out of it, and should be on opposing ends. The Paths should promote varying styles of approach to increase the overall fun factor for a wide range of players. The same principles of Paths into or out of a Space can be applied to cross map Paths.